Just a short distance from the Suffolk coast, the beautiful, historic market town of Woodbridge lies on the banks of the River Deben. From the Tide Mill on the Quayside to the selection of unique shops and cafés on the Thoroughfare, there is genuinely something for everyone; a fascinating town to explore. We have a wonderful selection of holiday homes in Woodbridge itself as well as the surrounding area; in the countryside and on the coast. Click the 'read more' tab for a brief overview of some of the surrounding towns and villages, or for more detailed information visit our Woodbridge Area Tourist Guide. Less than half an hour away from Woodbridge is the small, fascinating town of Orford, home to a few of our properties. The town has a rich medieval history and Orford Castle is an exciting day out for all members of the family, young and old! Orford Ness nature reserve is also a must visit for those keen to explore the Area of Outstanding Natural Beauty in which these towns are situated. Bawdsey, Shottisham and Shingle Street echo the curves of the River Deben from Woodbridge to the coast. These villages and hamlets are excellent, peaceful places to stay to explore the Suffolk countryside and coast alike. Just south of Woodbridge you will find the village of Waldringfield where you take some particularly picturesque river walks. Long and short trails for walkers of all abilities can be followed and a peaceful stroll or invigorating hike can return you to Waldringfield’s Maybush Inn, for a superb plate of food after you have worked up a hearty appetite. 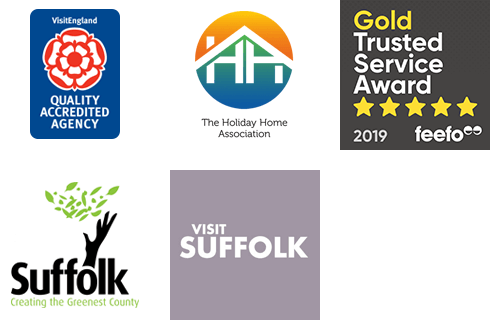 Take a little time to browse through our selection of holiday cottages in and around Woodbridge. We’re certain you’ll find somewhere just right for a truly fantastic Suffolk holiday. A central apartment in the heart of the hamlet of Felixstowe Ferry, with breathtaking views over the water to be enjoyed from the private balcony and master bedroom.